It's hard to believe that the World Equestrian Event is finally here. I drove through downtown Lexington KY a few days ago and there was so much going on to prepare for the event. It's a nice time to be proud of Central Kentucky. The beauty that we all get to live and work in every day will be experienced for the first tiime by many visitors. This is so important for our economy even though Lexington was barely touched by all the recession. Real estate is still selling well and interest rates are low. Relax and please think of how lucky we are here. Have some patience on the road as it will be a little bit congested. Just remember that the car full of people in front of you will be bringing some extra dollars our way to keep us all working and busy. Look at that slow car and think...MONEY!! Take a deep breath and stay calm...it's only for 16 days! Read the Herald Leader Interview with Lizette Realty discussing Kentucky Relocation. 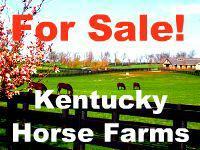 Finding a new Kentucky home has never been so easy! Just click on one of the links below. #1 featured Kentucky Realtor on Activerain.com and Localism.com. Publisher/Author for the only Central Kentucky email newsletter on local real estate listings and sold properties, Kentucky relocation, local events, homeowner information and fun! Lexington KY real estate click on Lizette.us. Got Bed Bugs? Woman Burns Down House To Get Them Out! Are You Ready To Look For Greener Pastures? Relocating To Kentucky?